Great Kings' War is the first sequel to Lord Kalvan of Otherwhen written by John F. Carr and Roland Green. Century equivalent parallel time-line. Here he comes face to face with warriors armed with pikes and broadswords, not petty criminals. Lord Kalvan, as the locals call him, transforms the petty Princedom of Hostigos into a fearsome warrior Kingdom by inspired leadership and advanced military knowledge. This file contains edited pages of the novel Great Kings’ War in an unusual pagination order. Yellow post-it notes accompany each page that the editor made corrections on with pen or marker. Except for title page, which has no date on it, all other pages on the bottom right hand corner are dated 03/09/2006. The file name for all pages shown on the bottom left hand corner is labeled “Great King’s War INT-P2.indd. One edited draft of the novel Great King’s War by John F. Carr and Roland Green. Dates of when this draft was printed are 01/09/06, 01/18/06, 01/20/06, 01/23/06 and 01/25/06. The file name for the draft is labeled “Great King’s War INT-P1.indd.” Editor of this draft is unknown, while the editor’s marks appear in red ink. The first page has ”AND ROLAND GREEN” circled with an editors note next to it. There is one green post-it flag that marks page 134 in the draft. The map section in this draft has been left blank. One edited draft of the novel Great King’s War by John F. Carr and Roland Green. Dates of when this draft was printed are 01/09/06, 01/18/06, 01/20/06, 01/23/06 and 01/25/06. The file name for the draft is labeled “Great King’s War INT-P1.indd.” Editor of this draft is unknown, while the editor’s marks appear in red ink. Page 45 is marked with a post-it note marked with additional editor notes. Page 482 is marked with a post-it flag. The first page has one yellow post-it flag and one editor’s mark stating “same type size>” next to the names of John F. Carr and Roland Green. The map section in this draft has been left blank. One edited draft of the novel Great King’s War by John F. Carr and Roland Green. Dates of when this draft was printed are 01/09/06, 01/18/06, 01/20/06, 01/23/06 and 01/25/06. The file name for the draft is labeled “Great King’s War INT-P1.indd.” Editor of this draft is unknown, while the editor’s marks appear in red and black ink. Post-it flags mark pages 72, 85 and 117 with editor’s marks on those pages. The map section in this draft has been left blank. One edited draft of the novel Great King’s War by John F. Carr and Roland Green. Dates of this drafts print are 03/01/06, 03/08/06 and 03/09/06. Two file names appear on the bottom left corner of the draft, “Great King’s War INT-P2-del4.indd” and “Great King’s War INT-P2.indd.” Editor of this draft is unknown, while the editor’s marks appear in red ink. Post-it flags are scattered throughout the draft marking pages with corrections. The maps for the book appear on pages xi-x. The cover page has editor’s marks circling the title and authors names, while in parenthesis “same as cover” has been written. Edited draft for the expanded and revised edition of Great Kings’ War by Roland Green and John F. Carr. Editor of this draft is unknown, while the editor’s marks appear in red ink. There are brown stains on the bottom of pages 298 to 314. The draft starts on page i and ends on page 603. Edited draft for the expanded and revised edition of Great Kings’ War by Roland Green and John F. Carr. Editor of this draft is unknown, while the editor’s marks appear in pencil and red ink. The draft starts on page iii and ends on page 603. These correspondence letters are from John F. Carr and Roland Green. The dates of these letters range from 1982 to 1987. 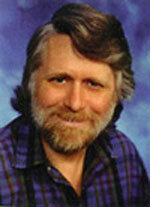 The letters tend to focus on the Lord Kalvan series of novels that John F. Carr and Roland Green were writing together. Aside from their correspondence letters, there is a fan mail letter, a black and white sketch related to the Kalvan series, and a photograph of Roland Green’s family. There is smoke or fire damage to most of the letters in this folder along the outside edges of each piece of paper. 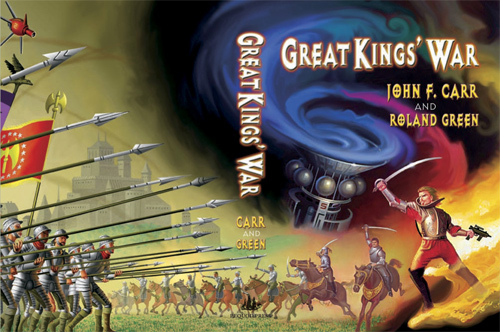 One paperback copy of Great Kings’ War by John F. Carr and Roland Green. An Ace Original publication, published in March 1985. The book’s condition is tattered and torn. It is missing about the first 65 pages of the novel. There are notes written in pen on many pages from John F. Carr. 633 loose sheets signed by John F. Carr and labeled, “Final printout of Revised Great Kings’ War.” No editing marks appear on this document. The document has been spread into 3 folders, labeled Carr-06-06-A, B, and C.
A set of 5 pages torn from a spiral notebook. Notes appear on the back and front of these pages in black pen. At the top of the first page, John F. Carr has signed and dated a note that reads: “5/1/08. Very early (1983-1984) notes and thoughts on Kalvan sequel. These are the original notes! Discovered in old desk…” Carr is most likely referring to the first sequel to H. Beam Piper’s Lord Kalvan of Otherwhen, Great King’s War, written by Carr and Roland Green. The notes contain ideas and definitions for terms, people, and places, as well as descriptions of potential characters and events. A group of letters dealing with Carr’s novel Great Kings’ War from a file folder labeled “Great Kings’ War Legal Papers.” The letters range in date from 1983 to 1984, and include the publisher’s contract. The documents all bear smoke and fire damage around their edges. An inventory record dated 6/21/2006 regarding a hardcover edition of Great Kings’ War. The record is written on a set of carbon copies, of which the top and bottom copies remain. The contents of a file folder labeled “Great Kings’ War II Continuity.” It contains correspondence from Jim Landau regarding corrections to one of Carr’s novels, presumably Great Kings’ War. A typed document titled “Comments, Corrigenda, and just plain bellyaching on Great Kings’ War.” The document contains a long list of comments about John Carr’s Great Kings’ War, organized by the page number in the novel in which the comment or problem occurs. This folder contains a cover to Great Kings' War along with letters addressed to John Carr and Roland Green. Also included is some correspondence between John Carr and William Taylor.